It's no secret that I like a good adult beverage. I have a few stand-bys that I turn to. A Cosmopolitan or a Martini are my special occasion drink -- fancy nights on the town, a special happy hour with friends, holidays, etc. Then I am a Makers and Diet gal for football game days. You better believe we are stocking up this week since football kicks off this weekend!! Beer is good for tailgating and brewery tours. White wine is nice with a fancy dinner here and there. And then, for pretty much anything else, I like red wine. I'm not picky about the brand or type of red wine, just red in general works for me. While the guys can easily shift to canned beer, I have been hearing a lot of great things about boxed wine recently from my girlfriends. I know. I can hear you all saying, ick, boxed wine?! The hubs said the same thing. But trust me on this one. I got a stellar recommendation on this brand from a colleague, and OMG, it is so good. You would never. ever. know. that this is boxed wine. Bota Box is actually wine in a bag in a box, so there is none of that cardboard taste that plagues most other boxed wines. We grabbed the Malbec, and everyone who tried it at the pool party raved about it. What's your go-to beverage? 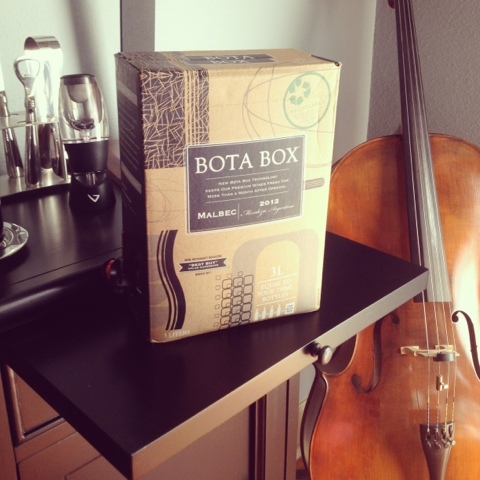 And have you tried Bota Box or any other boxed wines that we should try out? This is awesome! I'll have to try this. Jewel - I had a gal pal try the Cabernet last night. She loved that one, as well. Enjoy!